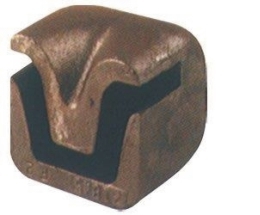 Protect the top of your U Channel sign posts from being smashed up and destroyed by using this drive cap. Easy inexpensive way to install one or more U Channel posts without digging. Fits any 2lb per foot post. Size/in. Appx 4" x 4"
Iron drive cap speeds up your installation time tremendously. Simply fit grooved section of drive cap on top of any 2lb per foot Heavy Duty U Channel sign post and drive it into the ground with a sledge hammer.